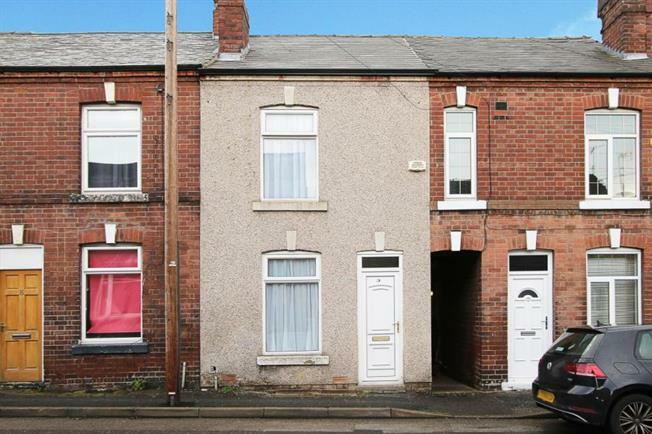 2 Bedroom Terraced House For Sale in Chesterfield for £90,000. Blundells are pleased to present this well presented two bedroom terrace home situated within walking distance of the town centre and local amenities. Enter the property into the cosy living room, neutrally decorated and plenty of space for a couple of sofas. The kitchen diner allows enough space for a dining table and is fitted with wooden effect wall and base units and a grey speckled work surface, with a waist height integral oven fitted. Upstairs are two large double bedrooms, the master has a small storage cupboard and the second ample of space for a double bed. The long bathroom is fitted with a white suite, complete with bath, wash hand basin, low level flush and a separate shower cubicle. The property does not stop there! Head downstairs and there is another reception room, larger than the lounge and has rear access to the garden so is ideal for the summer entertaining. There is also another shower room and small utility room with plumbing for washing machine and tumble dryer. Outside is a small rear garden with access down the side of the property. Chesterfield is a historic market town which lies 11 miles south of Sheffield but still within easy access to Derby. The busy market is on most days and the town centre is home to an array of High Street shops, Coffee chains, bars and restaurants. Excellent commuter routes via A617 to Junction 29 of the M1 motorway network along & within easy reach of Chesterfield railway station providing easy access to Sheffield, Derby & Nottingham. The property has on street permit parking right outside your front door.